FINALLY... a full length release from Skye Klad!! And well worth the wait. I first discovered Skye Klad in 1998 when I heard their Extreme Vacuum Person CDEP. Further sounds came my way later when the band shared a tape of some demo material they were working on. In each case I was struck by the inventive guitar sounds Jason Kesselring wrung from his instrument, an exciting blend of the cosmic and melodic, meditative and brain crunching. And last year at the Strange Daze 2000 Space Rock Festival I had the opportunity to see the band strut their stuff live with the addition of Salamander guitarist Erik Wivinus. 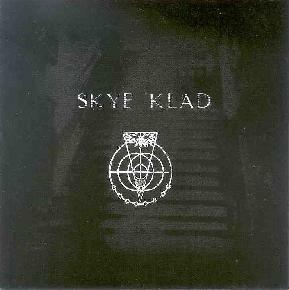 Skye Klad incorporate a number of influences including Can, Chrome, Spacemen 3, and Eastern music. The pairing of guitarists Kesselring and Wivinus is something of a space guitar dream team, with both musicians carefully creating cosmic sounds and textures that are equal in importance to the notes they play. The band consists of Kesselring on electric and acoustic guitars, glissando guitar, guitar loops, lap steel, theremin, and samples, Wivinus on electric and acoustic guitars, quadrone, hammered dulcimer, percussion, samples, e-bow, and vocals, Adam Backstrom on vocals, and Matt Zaun on drums and percussion, and Matthew E. Wells on bass (though I believe Dave Onnen is the current bassist). Wivinus and Zaun also play in Salamander (see review this issue). Powerhouse rocker "Minds Eye" opens the set, beginning in a similar style and intensity to the band's opening "Mother Sky" cover at Strange Daze. Backstrom's vocals have a dreamy quality that adds calm to what becomes a devastating guitar assault. It sounds like Helios Creed himself was in the studio with the band for this one. "Vespers" picks up where "Minds Eye" left off, a Chrome styled rocker with the dreamy vocals now gone harsh and efx'd. The heaviness continues with "Killer Goodnight", and the lyrics describe the music perfectly. "You once had power. But now it's dead. Drink from inside you. Like molten lead." Yeah!! "Sleep At The Bottom", "Toxaphene", and "Visceral Reaction" are all melodic, but molten drifting space pop songs with guitars that sound like dissolving comet tails. "Debutante" is a dark, spacey, but rhythmically busy song with wild percussion and droney searing space guitar licks. "Ionosphere" is a standout track with gorgeously drifting tapestries of psychedelic space guitars and lulling vocals. Kesselring and Wivinus achieve a perfect marriage and balance of harsh and meditative guitars, and this nine minute track is a cosmic mind blower that takes the listener on a journey that brings to mind all manner of influences covering the gamut of space, psych, Krautrock, and drone. And "Falling Clear" has a sludgy, mucho psychedelic, Stoner vibe. Skye Klad bear their trademark sound but do the Black Sabbath thing, kicking out acid licks while the bass carves a thudding hole deep into your chest. In summary, Skye Klad is a shining star among 2001's space rock releases. Definitely a set that will make all cosmic guitar fans drool. GET THIS NOW! Check out loads of songs at Skye Klad's Mp3.com site: http://artists.mp3s.com/artists/153/skye_klad.html. Skye Klad is distributed by Mutant Music. You can visit their web site at: http://www.mutantmusic.com. Contact via snail mail c/o Mutant Music; 100 N. 1st St; Suite 510; Minneapolis, MN 55401.